Last week, we noted that mobile photo-sharing app PicPlz rolled out a bunch of improvements to their app in an effort to better compete with rival Instagram. Sadly, that new polish was only for their iPhone app at the time. But today brings good news for Android fans: the same features! And there’s a bonus too: PicPlz is now accepting applications for access to their API. 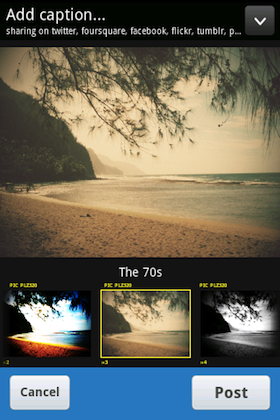 Live thumbnail preview of your picture with different filters applied. They also promise more speed improvements in the next iteration. The Android version is key for them because it is one way they definitely distinguish themselves from Instagram — which is still iPhone-only. The API, meanwhile, is another way they can potentially distinguish themselves — at least for a bit. Those interested are asked to sign up for the PicPlz API beta here. Instagram caused a bit of a stink when they pulled third-party access to their data a couple weeks ago. This wasn’t meant to be a hostile act, they simply want developers to wait to use their data until they have a proper API that can scale. “We’re testing it internally and with selected partners at this time,” they tells us.